Visit Magnolia Square this February at Paddington Town Hall and enjoy a curated line-up of local and travelled talent, showcasing fabulous craft, great design, fashion, food and a whole lot of style! Retailers at this Sydney show will include Bronnie Masfeau, Rustic Coast, Myrtle and Moss, Niki Catalano, Klei, and many many more! 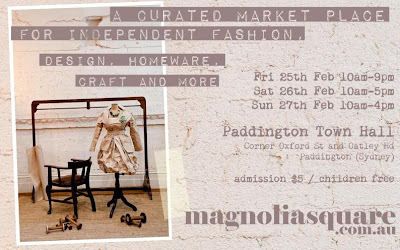 For enthusiasts of design, creativity & seekers of inspiration or to find out about upcoming 2011 Magnolia Square events happening in Sydney, Melbourne and Adelaide visit their snippets blog!